Krunchas are large, burly, blue and sometimes pink members of the Kremling Krew. Similar to Kannons being Klumps in pirate gear, Krunchas are Krushas in pirate gear. Despite this, they are noticeably shorter and wider than Krushas in their in-game sprites. The first appearance of Krunchas is in Donkey Kong Country 2: Diddy's Kong Quest as semi-common enemies. Krunchas are so muscular that regular attacks (such as jumping) have no effect on them, these only enrage them to the point that they turn red and move at a slightly faster speed. Krunchas can only be defeated with aid from an Animal Friend, by having an object (such as crate) thrown at them, or by teaming-up and throwing either Diddy or Dixie at them. Also, by teaming up, Diddy and Dixie can use their combined weight to defeat the Kremling with a simple jump, but this is only possible in the GBA version. When a Kruncha is enraged, it will damage the Kongs, but a Team-up throw will defeat Kruncha and leave the thrown Kong unscathed. Later in the game, a pink version of Krunchas are encountered. These Krunchas, if enraged, move at an even faster speed than an enraged blue Kruncha, and the pink variant also walk off the edge of the platforms. This pink variant is only found in two stages of K. Rool's Keep: Castle Crush and Clapper's Cavern. Krunchas also appear in Donkey Kong Country 2's pseudo-sequel Donkey Kong Land 2. There is no real difference between the Krunchas of Donkey Kong Country 2 and Donkey Kong Land 2. Kludge's Super Smash Bros. Brawl trophy mentions Kruncha, but only in the US version of the game. Krunchas appear in the following levels. 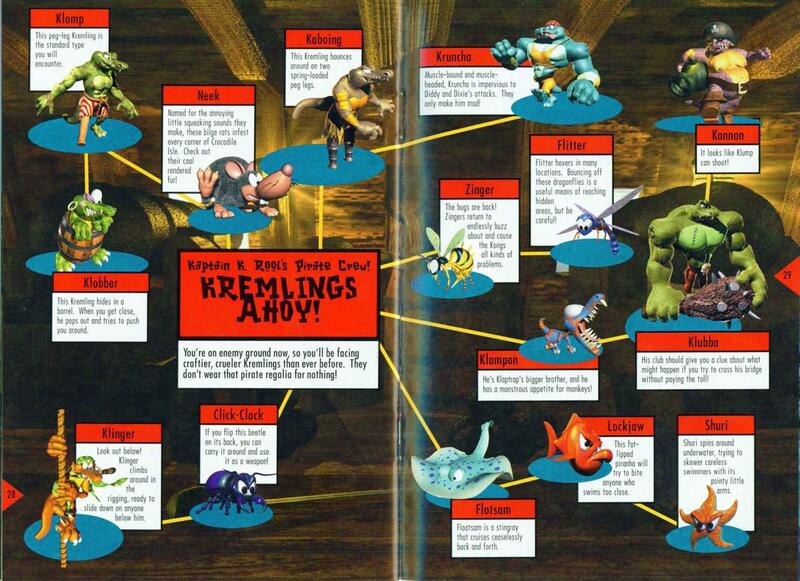 According to the game's credits, Krunchas belong to the "Kremling Kuthroats" enemy class. 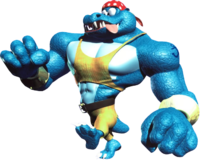 Krunchas are similar to Krushas, Krumples, and Kasplats, other large blue, burly members of the Kremling Krew. ↑ Donkey Kong Country 2: Diddy's Kong Quest instruction booklet, page 29. ↑ Steve Mayles. December 17, 2017. https://mobile.twitter.com/WinkySteve/status/942523428606799874. Twitter. Retrieved December 17, 2017. This page was last edited on March 27, 2019, at 20:08.